OK, why side dishes? 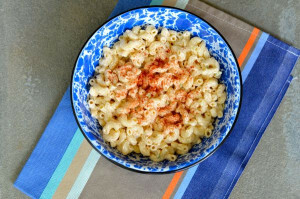 When I’m planning the menu for an all american barbecue that menu will include one of these classic side dishes: macaroni salad , potato salad or coleslaw. I think it’s essential to have favorite versions of each at the ready to prepare. They need to be delicious, yet simple. My first 4th of July on the Bay was such a meal. Coleslaw was not a problem, I fortuantely had my grandmother’s coleslaw recipe, which I have enhanced along the way with additional herbs and lemon juice. I developed a great potato salad recipe one day, really by accident when I had leftover roasted baby yukon potatoes. I have been serving it ever since with raves from all my family and friends. 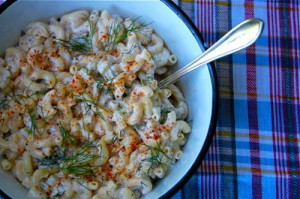 For me, macaroni salad was the side that I didn’t have my go to recipe. 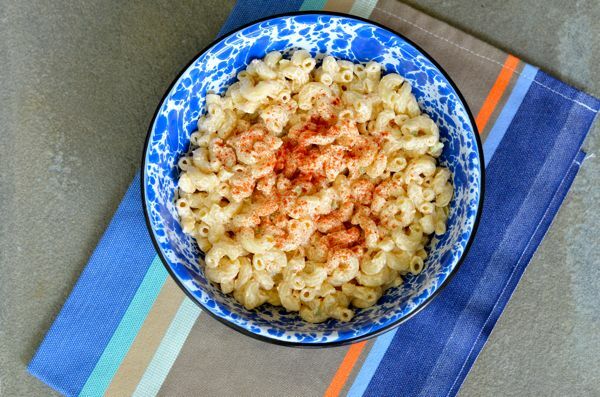 I spent hours looking for the perfect macaroni salad recipe. It sounds silly but so many had too many extra ingredients : ham, relish , eggs etc. So many versions but none really appealed to me, so I needed to come up with my own. This recipe is light on the mayonnaise and refreshing with the lemon juice, celery and dill. Hope you will make these your great american side dishes too! In a large bowl place all ingredients and mix well. Cover the bowl with plastic wrap and chill for at least 8 hours. This can be served cold or at room temperature. 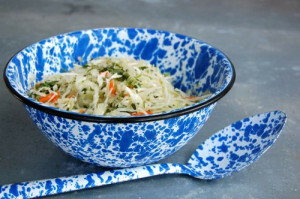 Hint: Use a mandolin when shredding your cabbage, the thinner the cabbage is the better the coleslaw will taste. Preheat oven to 400F. Toss potatoes in bowl with salt , pepper and olive oil. Arrange potatoes into single layer in an ovenproof baking dish. Roast approximately 1 hour, until golden brown on outside and tender when pierced by a knife. Cool completely. Sliced potatoes ½ inch thick and place into bowl. Add mayonnaise, sour cream, herbs, scallions, lemon juice and salt and pepper to taste. Mix well. Serve immediately or cover and refrigerator until ready to serve. The mixed chop herbs should be parsley and dill about half of each. 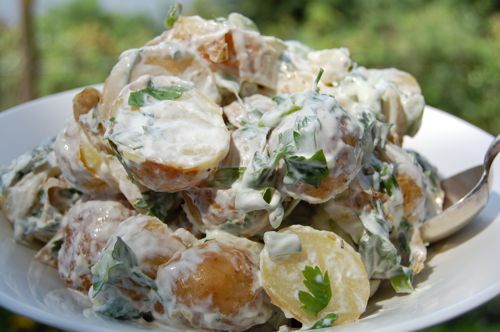 Remove from the above recipe mayonnaise, sour cream and lemon juice. In it’s place make a dressing with ½ cup olive oil, 3 tablespoons apple cider vinegar and 1 tablespoon grainy mustard. Whisk together and pour over the potatoes and herbs. Garnish with crumbled bacon from three cooked slices. In a large bowl add all ingredients. Combine well. Serve immediately or cover and refrigerate until ready for use. Before serving from the refrigerator add 3-4 tablespoons of water to add a little moisture. Garnish with additional paprika and dill leaves. This entry was posted in salads, side dish and tagged 4th of July recipes, cilantro recipes, coleslaw recipes, herb recipes, macaroni salad recipes, outdoor entertaining recipes, potato recipes, potato salad recipes, roasted potato salad recipes, summer food, summer recipes on May 23, 2014 by entertainingbythebay.